Only two vital records researchers are permitted in the Cheboygan County genealogy research room at one time because of space limitations. Birth, death, and marriage records are all available from 1867 to the present, however birth records are not open to the general public. The research area is located with the Cheboygan County Clerk at 870 South Main Street in the county seat of Cheboygan, MI. While some believe the word cheboygan means "big boat," the actual meaning is not definitively known for sure. The county shares the same name as the Cheboygan River, which flows south from Lake Superior and is located exclusively within the county limits. 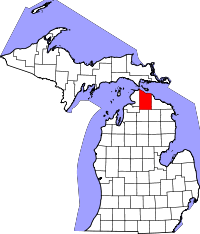 Cheboygan County is located at the northern tip of the southern half of Michigan, directly at the point where Lake Huron and Lake Michigan meet. As such, the Port of Cheboygan is an important port for the water traffic in the area.